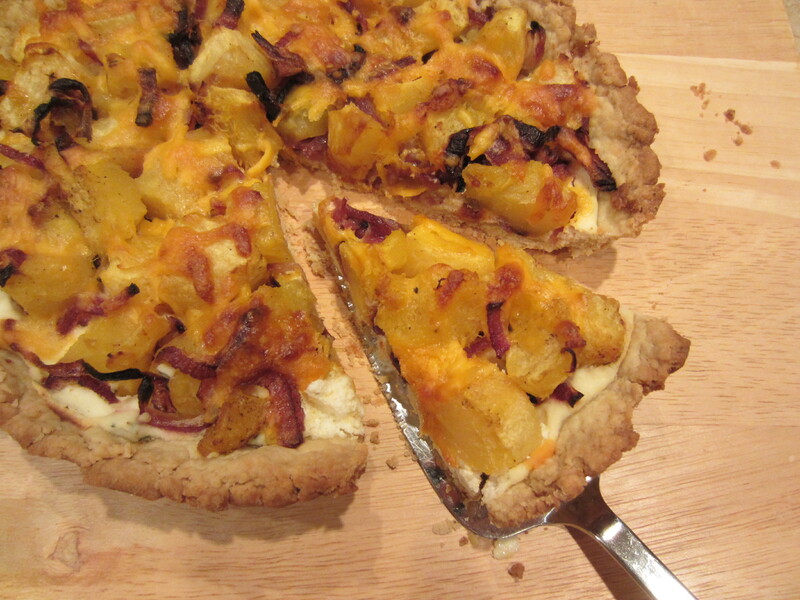 Simply Savory are two words to describe this tart made with Acorn Squash, Caramelized Onions and Ricotta Cheese. It is the season for winter squash and there are so many different ways to prepare them. 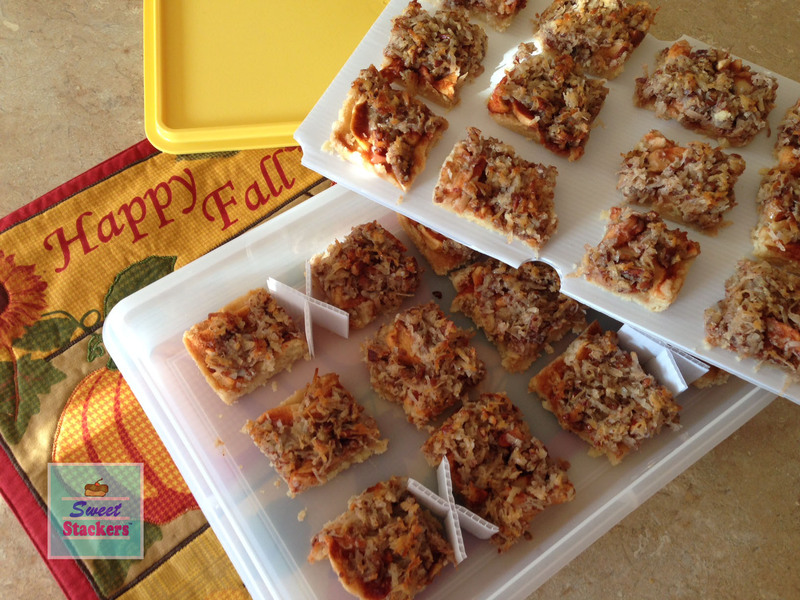 This rustic tart is perfect for fall! Wouldn’t it even make an impressive side dish on the table for Thanksgiving dinner? 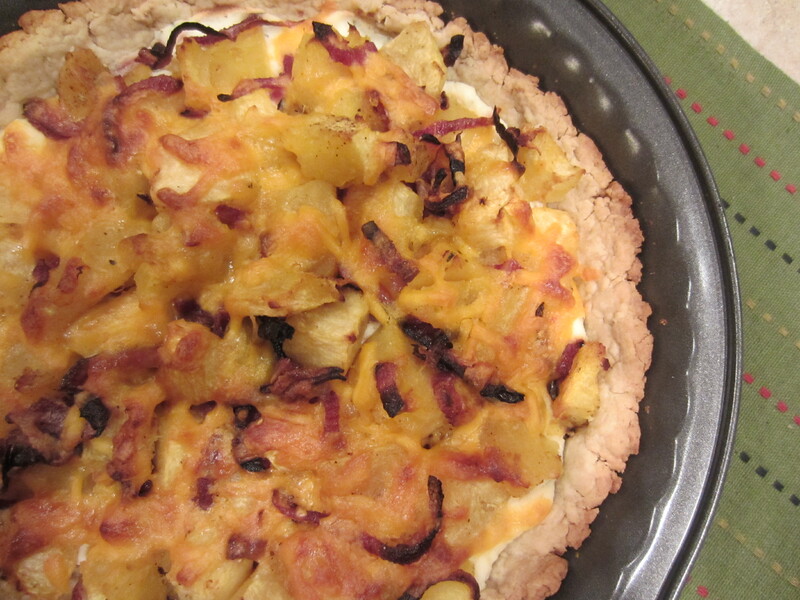 The tasty, crumbly crust was easy to make and only used a handful of ingredients. Using a food processor, the dough came together and was in my fridge within a couple of minutes – tops! In the past, I have been turned off from buying winter squash because they can be difficult to handle, peel and cut when raw. Today, I softened the squash by piercing it 4- 5 times, then placing it in the microwave for about 7 minutes. The outside of the squash was slightly softened , which made it much easier to cut in half lengthwise. Once it was halved, the seeds and strings were removed. The squash could be sliced further and the skin removed. Place the flour, salt and baking powder in a food processor and pulse 2 times to mix the ingredients. While the processor is running, drizzle the olive oil and water into the flour mixture. The dough will start to form a crumble. Remove and knead the dough together. Form a disk and wrap it in parchment or wax paper. Place in the refrigerator for at least 30 minutes. Preheat the oven to 450°. Cut squash into large diced pieces. In a large mixing bowl, toss the squash with 1 tablespoon of olive oil. Place on a baking sheet in one layer. Toss the sliced onion in the remaining olive oil and place next to the squash. Salt and pepper the squash and onions. Bake for 25 minutes. While waiting, combine the ricotta cheese, lemon and thyme in a small bowl. Remove the dough from the refrigerator and press into a round 9″ tart pan. Spread the ricotta mixture over the dough. Once the squash and onions have been caramelized, remove from the oven, reduce the heat to 400°. Place the squash and onion on top of the ricotta mixture. Sprinkle with the cheddar cheese. Bake in a 400° for 40 minutes until golden brown. We have already seen our first “real” snowfall and the mornings are dark, chilly and getting hard to get out of bed. Tomorrow, I will have a warm comforting breakfast awaiting me in my fridge. Yes, I said warm, because you can heat this up so quickly – being convinced that you have made a comforting homemade breakfast even though you baked it last night. 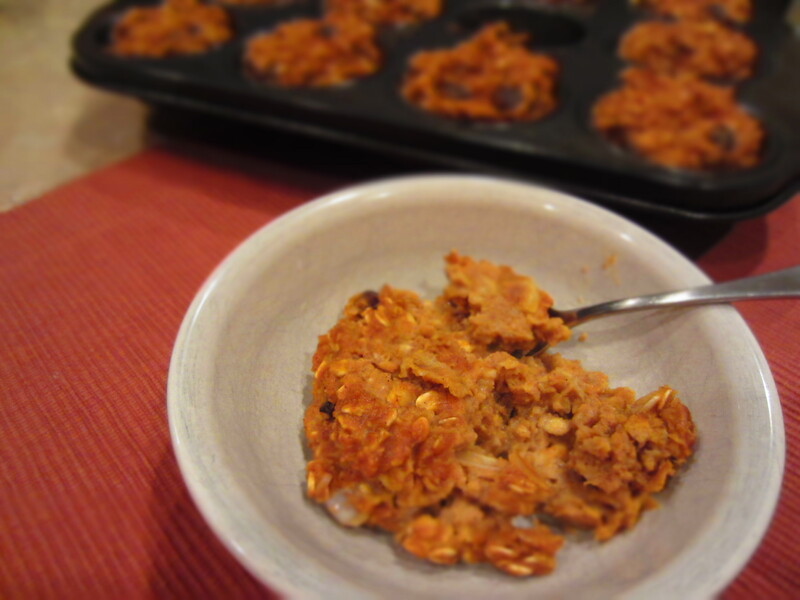 Baked oatmeal can be made in an 8×8 pan, but I prefer to bake it in a 12 count muffin tin. This produces these cute little portions of oatmeal that are easy to refrigerate and heat up in a pinch. Preheat oven to 350°. Coat a 12-count muffin tin with cooking spray. Combine all of the ingredients in a large mixing bowl. Using an ice cream scoop, evenly fill each muffin cup with a scoop of the oatmeal mixture. Bake for 25 – 30 minutes. Serve hot right out of the oven or refrigerate the baked oatmeal portions. A quick breakfast for days to come! The oatmeal can be served warm with a drizzle of milk or maple syrup. This is, by far, my favorite time of the year! There is something about the fresh crisp air, the hues of rust & orange, and the smell coming from my kitchen. Somehow, I become obsessed with pumpkin. In fact I am constantly stocking up my pantry with canned pumpkin as if I am not going to find pumpkin until next fall. I love cooking and baking with it….pumpkin pancakes, pumpkin pie to pumpkin soup, oh my! Last week I saw a tweet for Pumpkin Cheesecake Cookies. Funny enough I “heard” Pumpkin Cheesecake and the cravings started. I didn’t even realize at first that this was a cookie recipe. 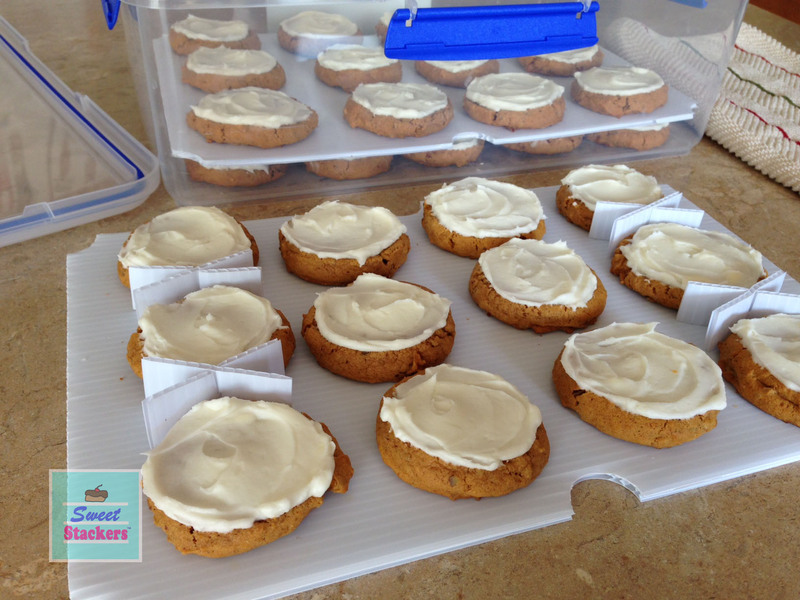 But creamy pumpkin cheesecake in the form of a chewy cookie…I must try! The recipe came from Jennie via her The Messy Baker Blog. (sounds like she is just as obsessed with pumpkin as I am!) What a yummy and super easy recipe! I can’t even explain how good the house smelled while I was baking these cookies! 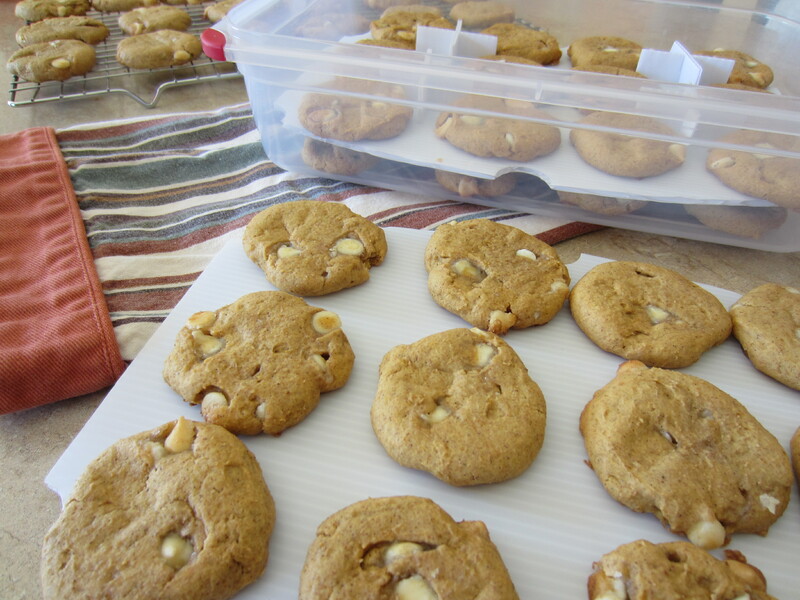 These cookies were very moist and chewy, definitely more “cake-like”. 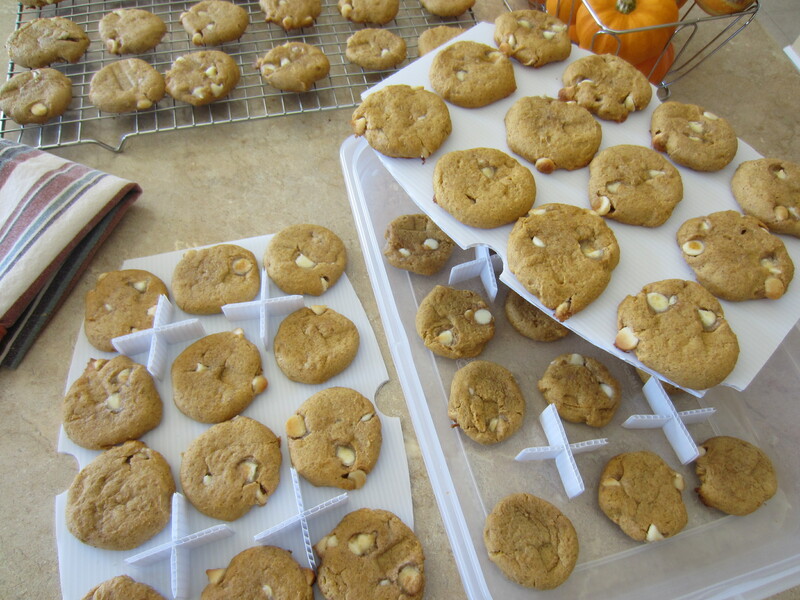 When they came out of the oven, I pressed them a bit to flatten them with my cookie spatula. Then transferred them to a cookie rack to cool completely. After they were completely cooled, they should be stored in a air-tight container and separated so they don’t stick together. In The Messy Baker Blog, it was mentioned to separate them using parchment paper. This is why I designed Sweet Stackers – reusable trays that fit inside air-tight food storage containers to separate and stack cookies. 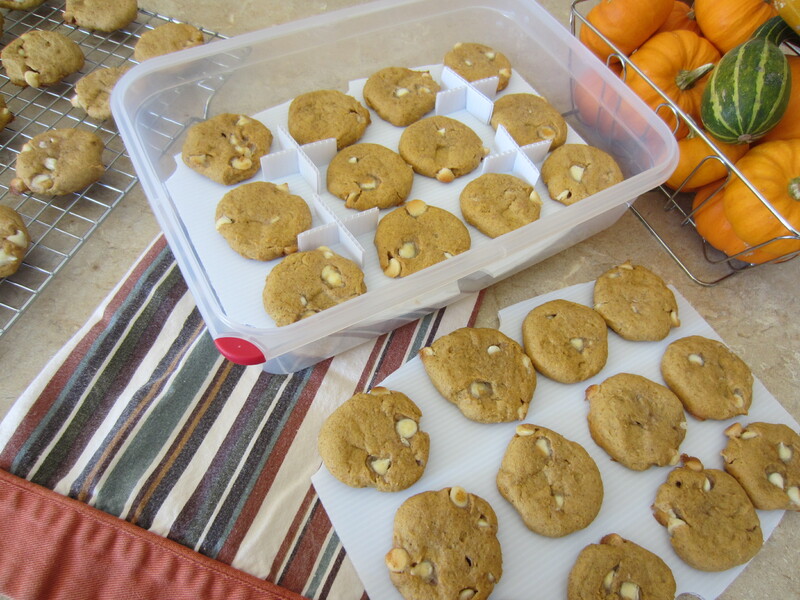 I was easily able to fit 36 – 2 inch sized cookies in a 9″ x 12″ container in three layers! 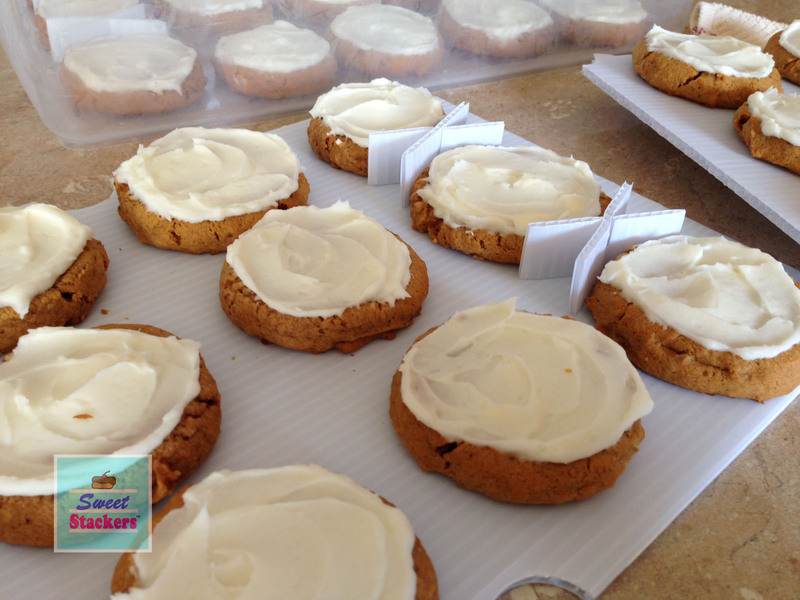 Holiday cookie baking is right around the corner – visit my website Sweet Stackers! Pumpkin Muffins – two ingredients? Muffins with only two ingredients? I saw this recipe on Pinterest and was totally skeptical! 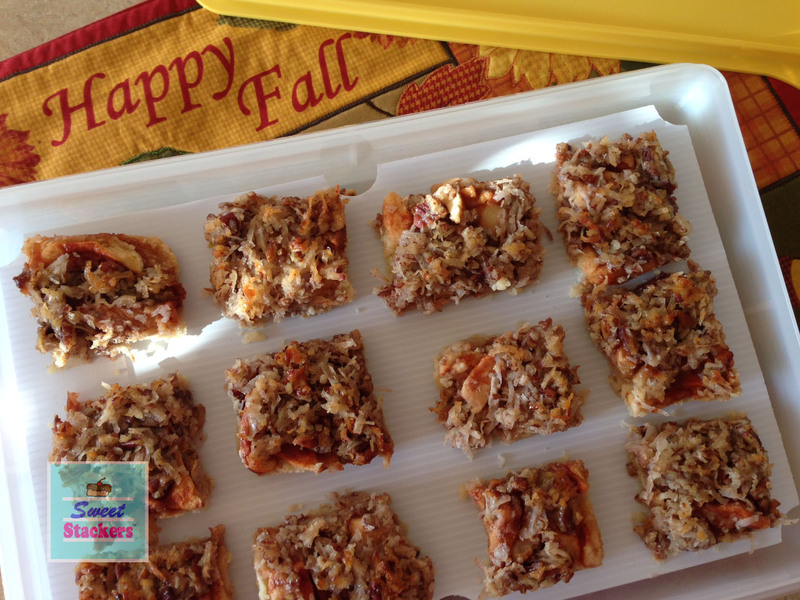 So now that I tried it – get out that healthy can of pumpkin and celebrate autumn! 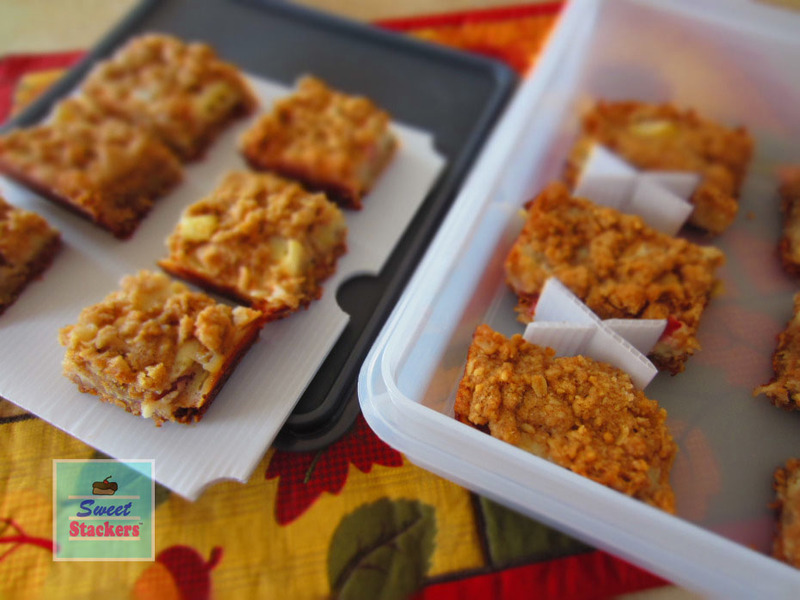 Kid & Mom approved – great snack for a lunch box or afterschool treat. For this batch, I used a chocolate cake box mix and one 15 ounce can of pumpkin. With an electric mixer, combine the ingredients. Add a couple of tablespoons of milk to moisten the batter if needed. For kicks, add 1 teaspoon of pumpkin pie spice…spice it up! With a little research you can use any flavor of cake. I am sure that spice cake would be pretty yummy. 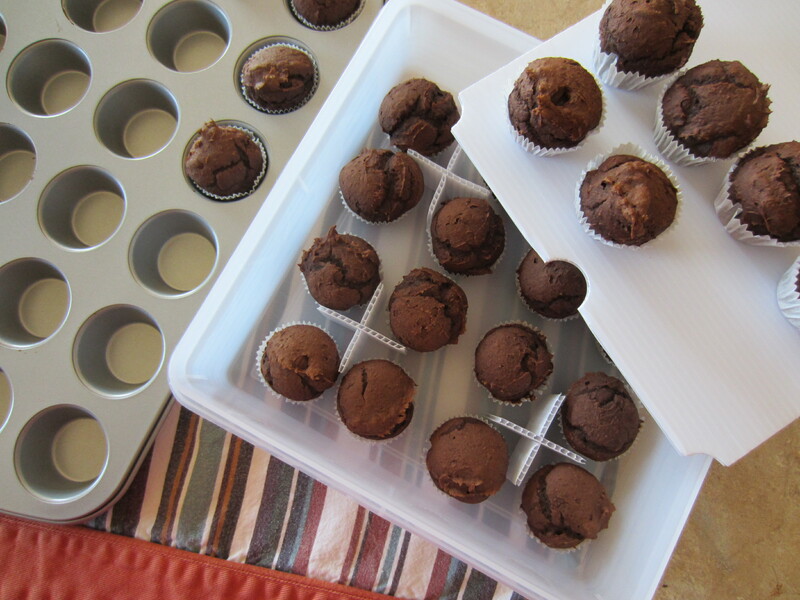 For mini-muffins: Bake in a 350° oven for 15 minutes or until a toothpick comes out clean. Store these moist cupcakes using Sweet Stackers stackable food storage trays. The trays separate and divide your food items in one container without a mess – visit sweetstackers.com! 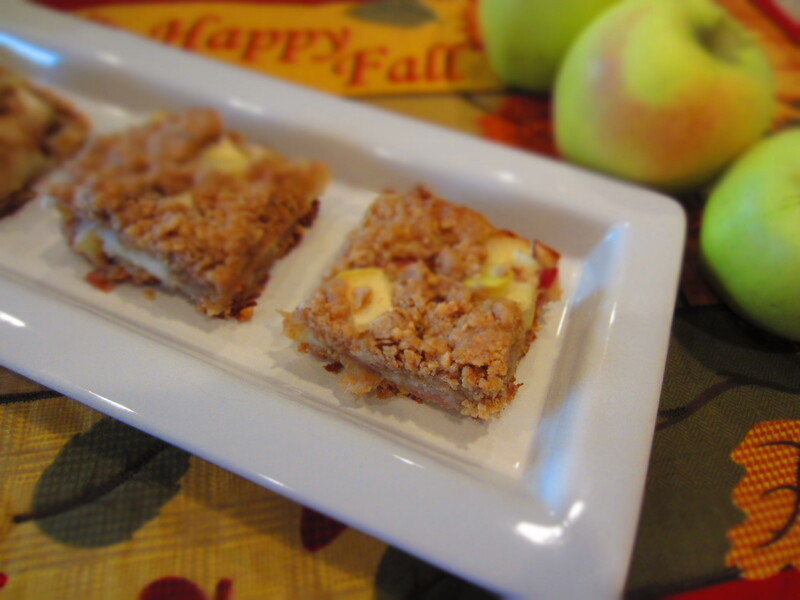 Fall is in the air and it’s time to celebrate the apple harvest! This recipe produced a comforting, warm right-out-of-the-oven, scrumptious dessert – perfect on a gloomy fall-like day. Preheat the oven to 350°. Combine the softened butter and brown sugar in a mixing bowl and beat with an electric mixer until creamy. Gradually add the remaining crust ingredients until well combined. Press half of the crust into an ungreased 9×13 pan and bake for 8-10 minutes until lightly browned. Mix all of the filling ingredients by hand. Pour the filling over the partially baked crust. Crumbled the remaining crust on top and press down lightly. Bake for 30-35 minutes until the top is golden brown. Cool completely before cutting into bars (or carefully sneak one out). Dessert bars like these Sour Cream Apple Bars store neatly in one air-tight container using Sweet StackersTM stackable trays. Stores perfectly in the refrigerator without a mess and transports easy to a party. 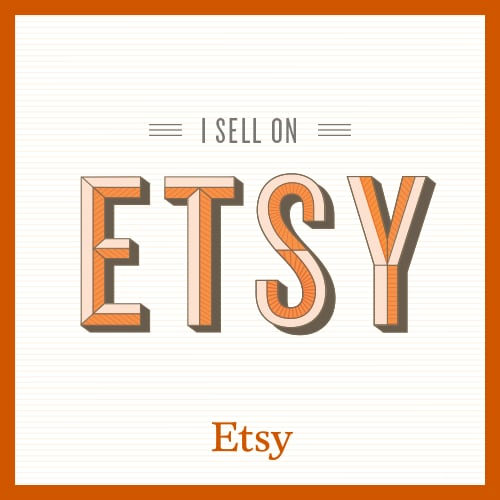 Visit my website for more information sweetstackers.com! A healthy way to start the morning with the flavor of pumpkin pie! Yummy! Here is a great way to use up your pie pumpkin and their seeds! My last post describes how I roasted pumpkin. 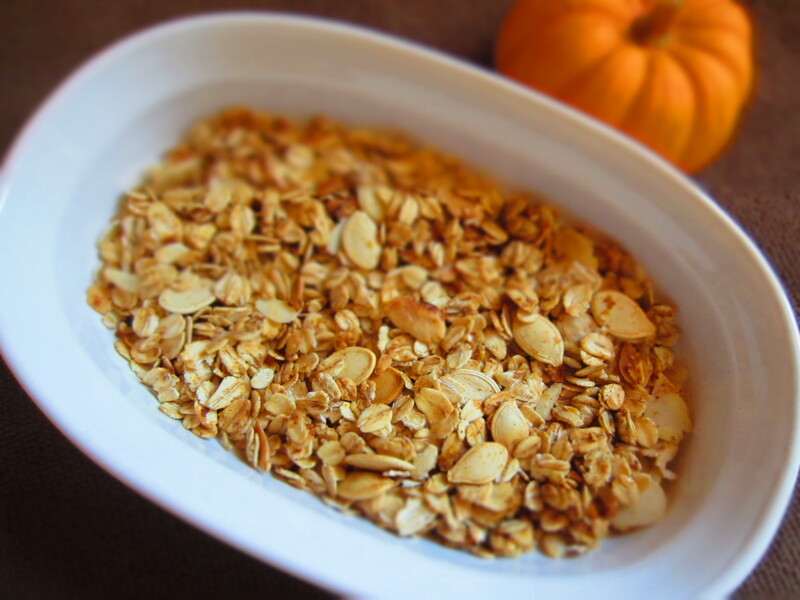 This pumpkin pie granola is made with oats, almonds, roasted pumpkin and pumpkin seeds and a little sweetness from pure maple syrup. The special ingredient is flavoring it with pumpkin pie spice! In a large mixing bowl combine the oats, almonds and roasted pumpkin seeds. In a small mixing bowl melt the butter, then add pure maple syrup, roasted pumpkin, salt and pumpkin pie spice. Mash up the roasted pumpkin into the mixture. Pour the wet ingredients into the dry ingredients until all of the dry ingredients have been coated evenly. Spread onto two cookie sheets. Bake in a 350° oven for 10 minutes, then stir. Bake for another 10-15 minutes until they start to turn golden brown. We woke up to our first dusting of snow. 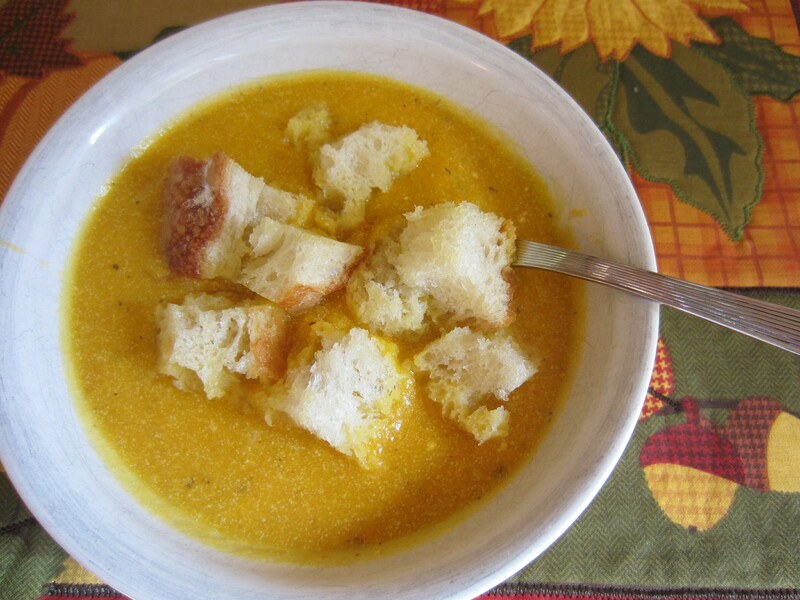 A perfect day to enjoy a comforting bowl of homemade pumpkin soup to celebrate the season! We had a few small sugar or pie pumpkins leftover from Halloween decor. I finally decided to use them for my cooking and baking. It is so easy, but the hardest part is cutting the pumpkin. I roasted the pumpkin by cutting them in half, scooping out the stringy pulp and seeds and then laying them cut side down in a low roasting pan with a 1/4″ of water on the bottom of the pan. I baked in a 400° for one hour. I now have enough roasted pumpkin for soup and two pies, plus some that I will freeze for my pumpkin pancakes. Melt butter in a large dutch oven and add onions, carrots, apple and pumpkin. Sautee on medium heat until the veggies and fruit are softened, stirring often. Sprinkle the dried thyme over the mixture, then add chicken stock. Bring to a boil, then reduce heat and let simmer for about 20 minutes. Puree the soup using a blender or immersion blender. Soup tastes great if served like this or cream it up by adding yogurt and half & half. Salt and pepper to taste. Note: Soup can be frozen for later use. This salad is perfect for fall and winter because pomegranates are in season. Since the summer, I have been trying to pick a “new” fruit or vegetable with my kids. “New” which means we have never bought it, chopped it or cooked it before. So I brought this fruit home and wasn’t sure what to do with it. I searched the internet and decided that my approach would be to remove the seeds in water. I really enjoyed the combination of sweet and tart in this salad and it was a big hit with my kids who are really not into eating green leaf salads yet. This would make a beautiful salad for serving when company comes over for the holidays. In a small bowl, whisk together all ingredients and set aside. In a large bowl, mix all ingredients. Drizzle with dressing, toss to coat and serve.